Wouldn't mind seeing the new AT-DT make an appearance at some point. 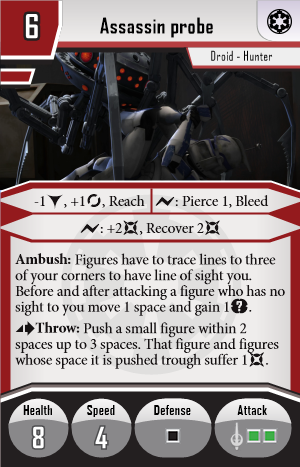 I know it's just another walker, but it could feature a really interesting mechanic for the game. Aerial Deployment: When you deploy the AT-DT, you may choose to deploy it to any exterior space on the map. Support Deployment: You may choose to wait to deploy the AT-DT until the start of the second Round. If you do, you may deploy it to any space within 3 spaces of one of your units. Not sure about who it should be, there are few unique characters with flamethrower as main weapon. I hope you have some ideas. When attacking, performing a special action or interacting you suffer 1 damage. If a cruel enemy damages you it recovers 1 damage and gains 1 ? power token. If you were defeated it gains 2 movement points and assault for this round. Spend 3 movement points to discard this. 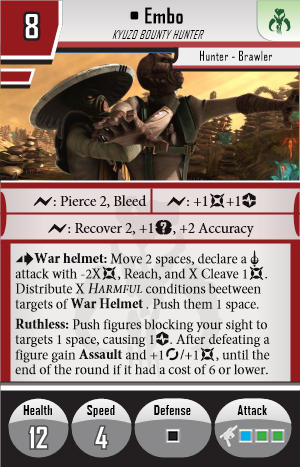 Imperial tank commander: essentially a generic General Sorin, buffs and commands nearby vehicles and heavy weapons, but not droids, and for an action can call in a mortar strike: pick a space 3-5 spaces away, roll red die, all adjacent figures take the damage. This would give a donut effect like the twin laser turret from X wing, and prevent self damage. 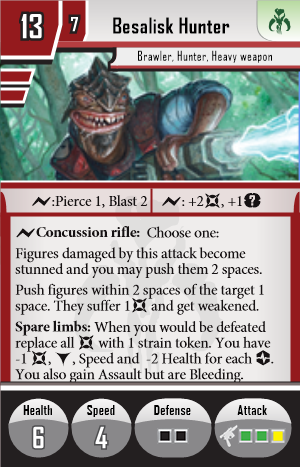 I really like the idea of the spare limbs ability, and love bringing this species into the game, but I think spare limbs would work better on a villain than a generic enemy. Going to try Pong krell maybe, not sure about other abilities yet. Cleave as action is like normal cleave just without the attack. Meant to let you cut trough multiple enemies while running like in clone wars. Maybe aganist rules but you can use 3 cleave 1 as cleave 3 (for cruel strikes). I've been thinking about the inevitable arrival of Yoda to IA. He should be along the lines of Emperor Palpatine in that he will have the innate pierce 3, an advanced force push action that can move up to 2 small figures or one large figure up to three spaces. He'd be slow at speed 3, but able to force sprint, and possibly buff nearby allies with an automatic surge, and would come with his own surge block to go with a white defense die. Not sure on offense, maybe red and green. Whatever Yoda ends up looking like, he should be a Non-combatant (cannot attack) with no offense dice and definitely no pierce. "Wars not make one great!" Yeah, I could see Yoda as like the ultimate focus (or other token) giver. He's a teacher in the OT, not a fighter. 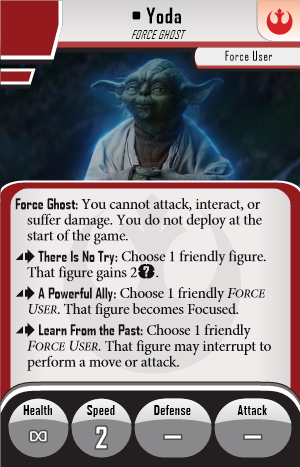 Maybe Yoda will be a support figure but purely for force users. I like the idea of him not being able to attack and maybe also that he cannot be defeated. In skirmish you could still gain VPs when he reaches damage = to health but rather than removing from the board he stays. Perhaps he could even become stronger somehow in his force ghost way? Lose a super force push power... gain some ghostly movement and support bonus. Do or do not: Distribute 2? power tokens to two friendly force users. Special Action - Powerful Ally: A friendly force user within 4 spaces becomes focused. Something like this? I've riffed off your ideas but made a few tweaks of my own. I like the ghost idea though, so I ran with it! Haha those look awesome. Really like the tweeks too. ?? I would love to see a big box expansion where you go to Endor. They could add Ewoks as rebel units, and maybe even a hero that is an Ewok. Since the rebels don't have any big miniatures I would like them to add a Ewok that is flying a glider and being able to bombard enemies it passes through. 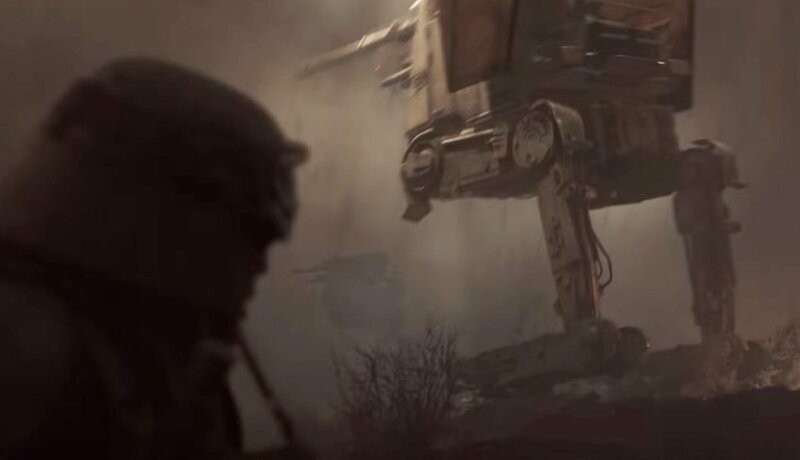 For the imperials you have to add speeder bikes and scout troopers. The scout troopers can be snipers for the imperials with the ability to become hidden. If some of you have any ideas for heroes or villains they could add, please respond. The only one I could think of is Wicket W. Warrick since he played a large role in helping Leia in episode six. 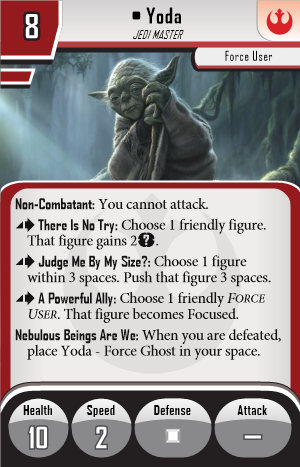 Another hero I would like to see is Yoda, even do it doesn't make sense it would be cool to have him in Imperial assault. 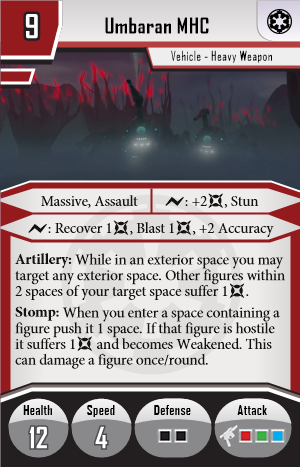 I'd like to see a blister pack of a Clawdite Assassin or something similiar, and have it come with more form cards that are interchangeable with the Clawdite from Heart of the Empire. It would also be interesting to have a mini campaign focused around the events of Solo, with the younger Han and Lando. I remember someone once suggested Ewoks would be merc units instead. I thought that was silly, because of obvious reasons, yet here we are with merc-aligned Loth-cats. Not that it's impossible, of course. The Rebels still have plenty of non-unique deployment groups for precedent. And for the record, I'd much rather see ewoks be Rebels. It just makes sense. Anyway, the only hero I could see them using if they did a canon named Ewok would be Wickett. He's already a bit of a stretch, but it wouldn't really make sense for anyone other than him since he's easily the most iconic ewok. Alternatively, what if we just added an Assassin role (and maybe a few others) to the Clawdite's repertoire? I was just trying to think of the most feasible way for them to add form cards to Clawdites, since they came in an expansion. And since FFG is into small, annoying creatures like loth-cats, maybe they'll put mynocks in the game as well. They can have three molds on one base and use the clear acrylic piece used for squadrons in armada to have them "fly" like they did the jet troopers. 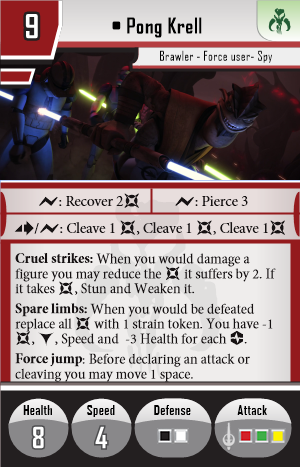 Give them a weak attack with extra damage to droids and vehicles, and the ability to weaken with a white die for defense. In a Zam Wesell Villain Pack? Really, any merc pack would be fine. They could even throw some in with Hondo, really. The pack would have to be standalone without the requirement to purchase HotE.